Once Home To A Dreaded Drug Lord, Medellin Remakes Itself : Parallels The Colombian city was the world's murder capital in the 1990s, but it managed to turn its fortunes around. Homicides were cut by 80 percent and made big gains on a number of fronts. But the city still faces many challenges in a region plagued by violence. 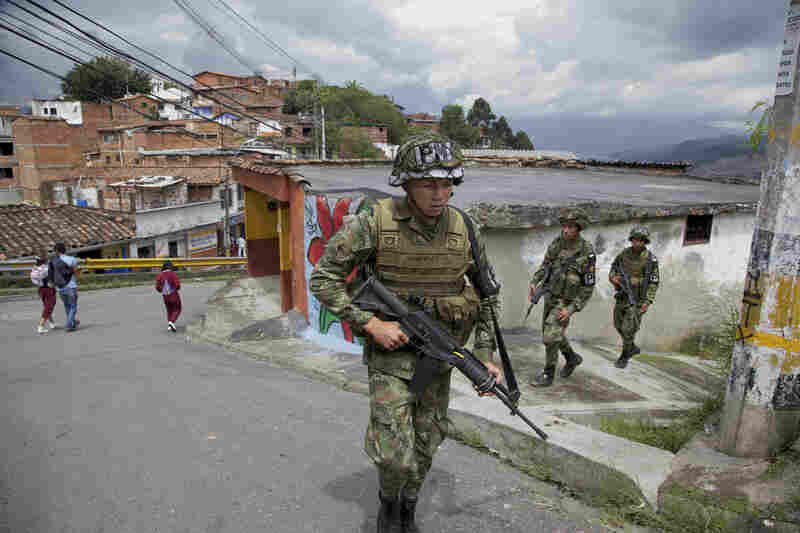 Colombian army soldiers patrol Medellin's Loma de Cristobal neighborhood after warring gangs forced dozens of families to flee. Medellin used to be the most dangerous city in the world, but officials embarked on innovative projects designed to make life better in tough neighborhoods. 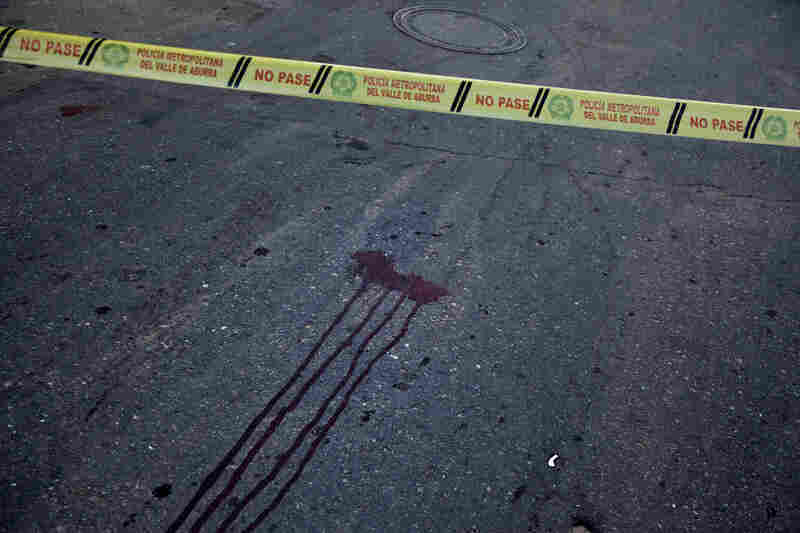 A double homicide in the neighborhood known as Beln in Medellin's southwest is marked by bloodstains. 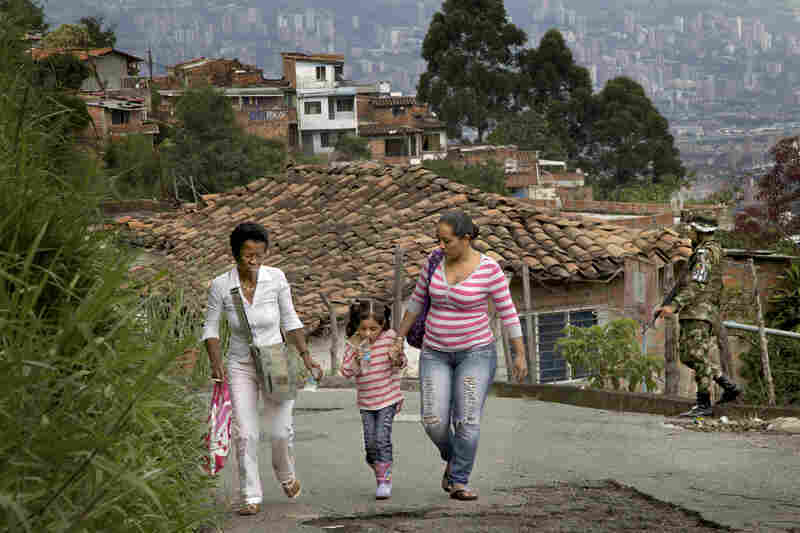 While the homicide rate has dropped by 80 percent, Medellin is not crime-free. 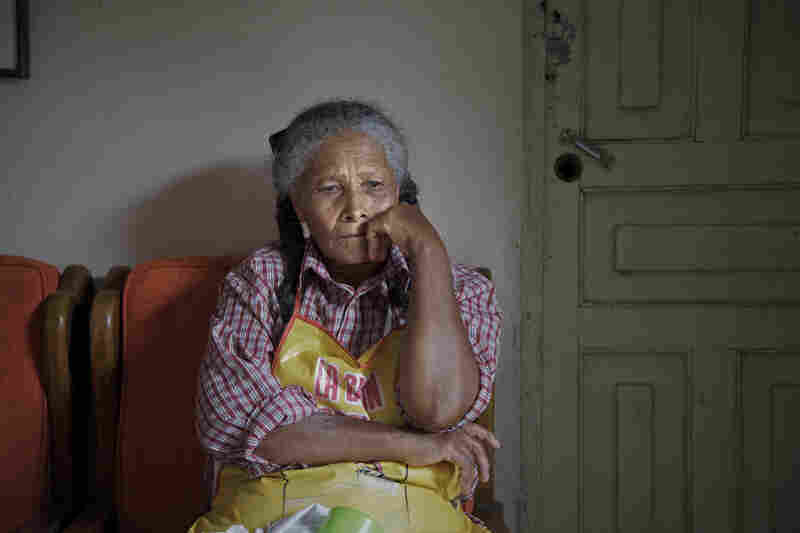 Mara de Los Angeles Posada, 75, left her home in the Loma de Cristobal neighborhood because of warring gangs. On her return she wonders when the violence will flare again after the army leaves. 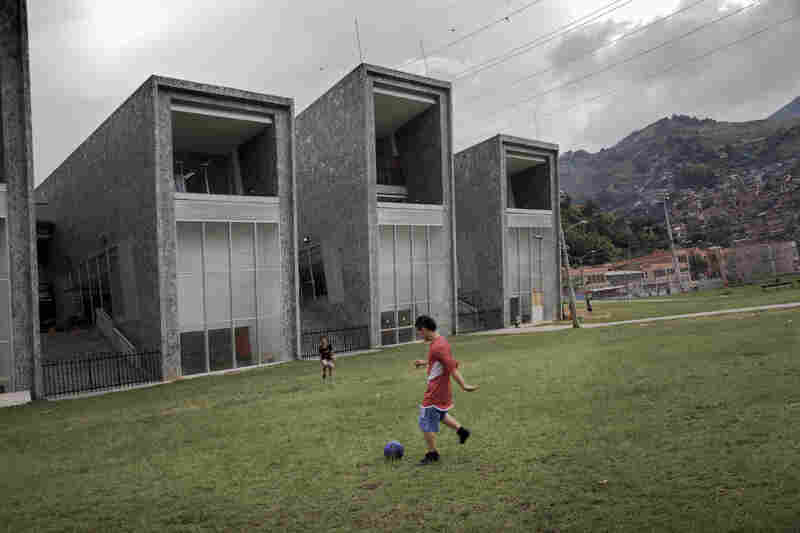 Boys play soccer in front of one of the new schools built by the city to improve the troubled Comuna 13 district. Gondolas that are perched high on steep mountains have been installed to connect Medellin's poorest neighborhoods. 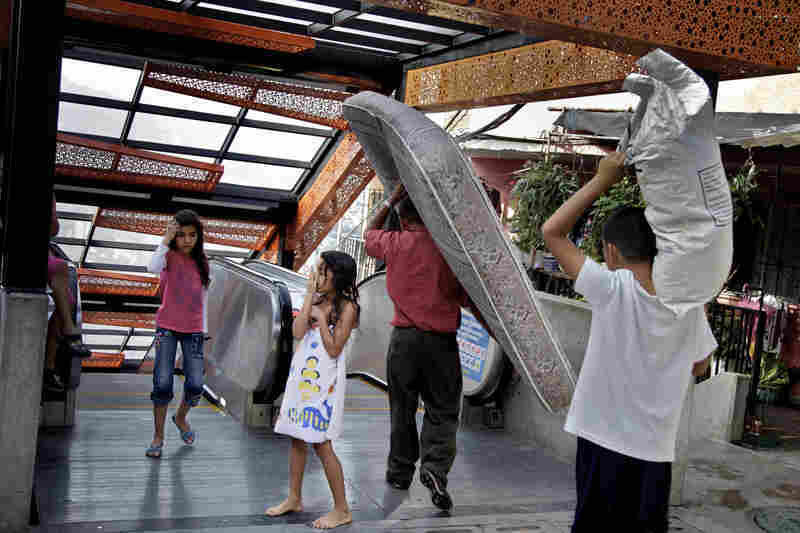 Electric escalators have been installed in Comuna 13 to ease the commute for people who live high in its upper reaches. Residents of Loma de Cristobal say they are happy to see troops patrolling their neighborhood and wonder if the sector will remain safe once they leave. Of all the violent cities of Latin America, one stands out as a great success story: Medellin, a metropolis nestled in the mountains of northwest Colombia. Once the home of the cocaine kingpin Pablo Escobar, it recorded more than 6,300 homicides in 1991, making it the world's murder capital. Then, one city government after another built schools and libraries, parks and infrastructure. The police also received an overhaul and became more adept at going after violent trafficking groups. The result was an 80 percent drop in homicides over a generation, making Medellin not only much safer, but also a model for other cities hoping to cut into crime. But 20 years after Escobar's death at the hands of Colombian police, it has become clear to city officials that the big gains on crime are hard to maintain -– showing just how difficult it is to make big cities safe in Latin America, which is beset by street violence and drug trafficking. The challenges were apparent on a recent day in the northwest barrio of San Cristobal, which is perched on an impossibly steep hillside with a bird's-eye view of the glittering skyscrapers below. Because cars can't make their way up, a team of soldiers deployed to protect residents had to lug their provisions up trails, carrying food, water and sleeping bags — as well as their assault rifles and ammunition. Though the city is no longer synonymous with drug violence, there presence showed that it also isn't crime-free. And in some cases, officials have to respond in an extreme way -– in this case using troops on city streets. The soldiers were deployed after warring gangs forced dozens of families to flee for their lives in May. With the arrival of the soldiers, the gangs abandoned the district and families returned, trying to go about their normal routines. But their flight and the response by the army show just how complicated Medellin's problems can be. Maria de Los Angeles Posada, 75, was among those who returned. She found a city seal on her door warning, "This home is being protected." The message was directed at would-be intruders: If they take on Posada, they are taking on the army. "Until now, we do feel safe," she said. "But who knows what it will be like later when they leave. That is what we are all thinking about, and it's making us afraid." Medellin has undergone a transformation in the last few years, what we call a metamorphosis because of its dimensions. All this in 20 or 25 years. We went from being the most violent city in the world to today being in the top 25. Like many of the proud residents of this city, Posada said Medellin has made great gains from the bad old days. That was when cocaine cowboys fought it out. A bounty was placed on the heads of policemen, and the dead piled up. And even after Escobar died on a city rooftop, shot in the head by police, the city was still murder central. There were more than 3,700 as recently as 2002, making Medellin the world's deadliest city that year. 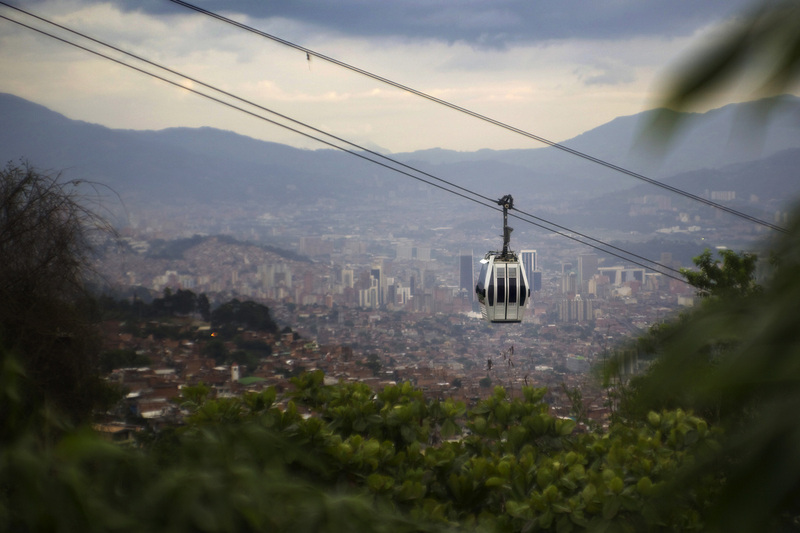 But local and national officials say a two-pronged approach transformed Medellin. First came a tough police and military presence — attacking drug gangs hard, killing or extraditing top kingpins, those who inherited the business from Escobar. Officials also embarked on innovative projects designed to make life better in tough neighborhoods while giving people a voice on how the budget is spent. The initiatives led the U.S.-based Urban Land Institute to name Medellin the world's most innovative city this year, beating out finalists New York and Tel Aviv. Those successes have also made Medellin a must-see for delegations of city officials and police brass from as far away as Rio de Janeiro and South Africa. The cable-car system moves tens of thousands of people each day, connecting them to a modern metro. "Medellin has undergone a transformation in the last few years, what we call a metamorphosis because of its dimensions," said Mayor Anibal Gaviria. "All this in 20 or 25 years. We went from being the most violent city in the world to today being in the top 25." The city built new, modern schools and futuristic libraries. There were new parks, complete with bike lanes and public squares. But the most famous innovation has been the use of gondolas and ski lifts to move tens of thousands of people each day, connecting them to a modern metro. 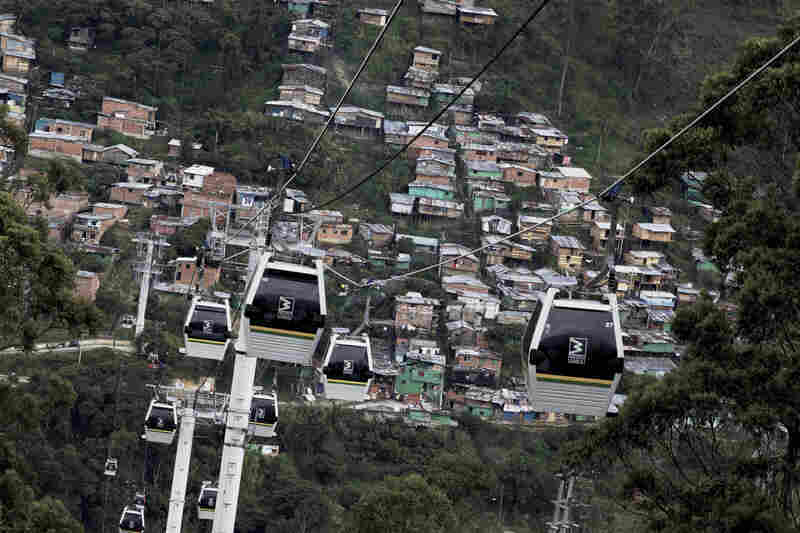 The city also found another way for residents to get around in neighborhoods built on mountainsides: an escalator that rises up the Comuna 13 district, taking residents 1,300 feet up toward their homes. Astrid Ramirez, age 38, is among those who gush about the investments. She lives in a district that used to take an hour to get to, riding a bus along narrow streets that rose up into the mountains. Now, she spends a quiet few minutes riding above it all in a cable car. "It's very good because it saves time from the traffic jams and it also saves money because you can ride really far for very little money," she said. But despite the improvements to mass transit, Ramirez expresses concern about crime. "On the theme of security, here in Medellin?" she said, frowning. "In all of Medellin? I think it's bad. There are too many gangs that want to take over the neighborhoods." Indeed, Luis Fernando Quijano, an expert on crime and gangs, says that Medellin remains a dangerous city. There are still warring drug traffickers, he says. He also talks of people who went missing and are likely dead, and the 9,000 residents who were forced from their homes last year because of crime. "I'm still worried," he said. Quijano said that extortion of small businesses remains serious, and that witnesses are afraid to talk to the police because of what street hoods might do to them. Aníbal Gaviria, the mayor of Medellin, says his city has undergone a dramatic transformation that is a model for Latin America. 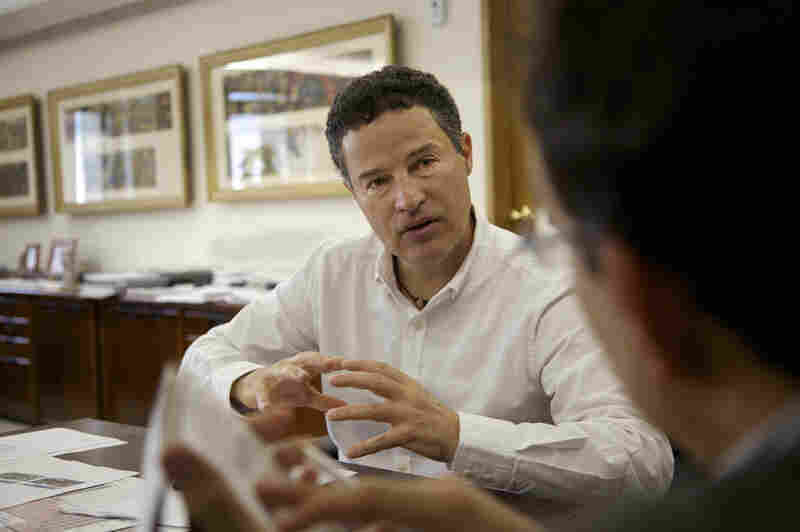 The mayor of Medellin, Gaviria, acknowledges there's too much violence, pointing to the 470 homicides in the city in the first five months of the year. But he's also optimistic, saying a better economy and government social programs have cut into income disparities and poverty — which he says fuel violence. "This signals a change that very few cities and very few societies can point to in a relatively short amount of time, which is 20 years," he said. Gaviria also explained that while crime in the city does rise and fall, the overall trend is a reduction. "We never get back to the historic highs we had," he said. "They are lower levels and they keep getting lower." The mayor says the key to it all is making sure there's a security presence in once-forgotten neighborhoods — even in places like San Cristobal, the district perched on a mountainside. As army troops settled into a house lent to them for staging patrols, Arnuflo Serna, the city's security director, said Medellin was showing both the residents and gang members that there was a state security presence. "We are guaranteeing security when we take over this place," he said. Among those who were thankful was Maribel Alvarez, 19, who has a 3-month-old baby, Isabela. Watching soldiers patrol, Alvarez said she felt safe. But she also said she hoped that the changes would be permanent. "I want a safe Medellin," she said. "You think of your children because they're just starting to live. You think about it for them."